Assayed by ELISA for direct binding of antigen recognizes wild type and recombinant GFP. Well suited to titrate GFP in solution using either form of the antibody as the capture or detection antibodies. 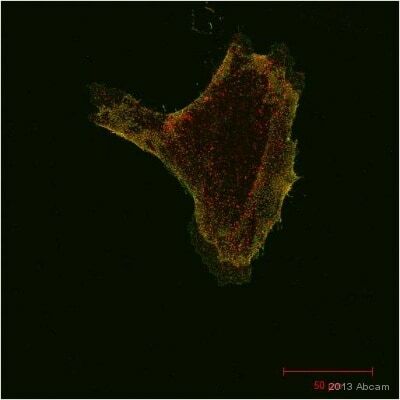 Shows no reactivity against red fluorescence protein (RFP). This antibody is known to cross react with the wild type (wt), recombinant (rGFP) and enhanced (eGFP) forms. Fusion protein corresponding to GFP aa 1-246. Full Length Fusion Protein. Derived from the jellyfish Aequorea victoria. GFP Monoclonal Antibody was prepared from tissue culture supernatant by Protein A affinity chromatography. Our Abpromise guarantee covers the use of ab1218 in the following tested applications. (See Abreviews). Recognises the immunogen under native conditions and reduced/denatured conditions. Sandwich ELISA 1/80000 - 1/500000. Can be paired for Sandwich ELISA with Goat polyclonal to GFP (Biotin) (ab6658). ab1218 can be used to detect GFP by ELISA (sandwich or capture) for the direct binding of antigen. Biotin conjugated monoclonal anti-GFP is well suited to titrate GFP in a sandwich ELISA in combination with polyclonal anti-GFP as a capture antibody. Additional bands at: 27 kDa. We are unsure as to the identity of these extra bands. C. Cells expressing BS-wt were stimulated with 0.5 or 10 mM Ca2+ for 60 min, 37°C, followed by fixation, permeabilization, and staining with anti-GFP antibody (secondary antibody tagged with Alexa-568). Confocal images of SEP and anti-GFP fluorescence are shown along with the merged image. D. Experiment as in C for cells expressing BS-5A mutant. HEK-293 cells were seeded on glass coverslips and transiently transfected with BS-wt or BS-5A cDNAs. Cells were incubated in DMEM containing 0.5 or 10 mM Ca2+ for 1 hr at 37°C, 5% CO2. Following incubation, cells were immediately fixed in 4% paraformaldehyde for 10 min, RT, permeabilized with 0.2% Triton X-100 (10 min), blocked with 5% serum and 0.1% BSA then incubated with monoclonal anti-GFP antibody (Abcam), followed by goat anti-mouse secondary antibody conjugated to Alexa-568. Immunoprecipitation using ab1218 at 0.01µl/µl HEK (human embryonic kidney) 293 whole cell lysate incubated with protein G matrix for 1 hour at 4°C. Total protein input was 3,000,000 cells. 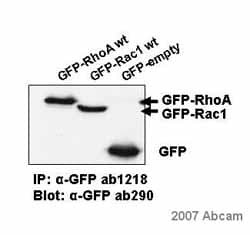 The western blot antibody was ab290 (undiluted). 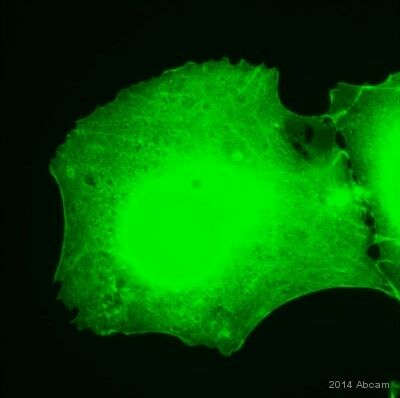 ab1218 staining GFP in human prostate epithelial primary cells by Immunocytochemistry/ Immunofluorescence. Cells (ARPE-19 cells transfected with mouse Rab27A-GFP) were fixed with paraformaldehyde, permeabilized with 0.5% Triton x100 and blocking with 5% serum was performed for 20 minutes at 25°C. Samples were incubated with primary antibody (1/500: in 1% goat serum, 0.1%TX100, 1XPBS) for 16 hours at 4°C. An Alexa Fluor®546-conjugated goat polyclonal to mouse IgG was used as secondary antibody at 1/500 dilution. 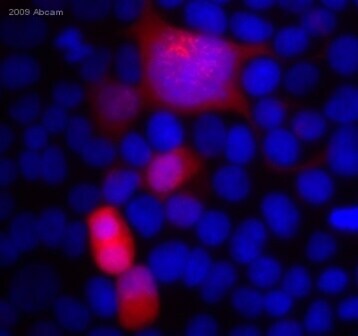 DAPI was used to stain the cell nuclei (blue) and mRab27A-GFP with ab1218 (red). Additional bands at: 26 kDa. We are unsure as to the identity of these extra bands. 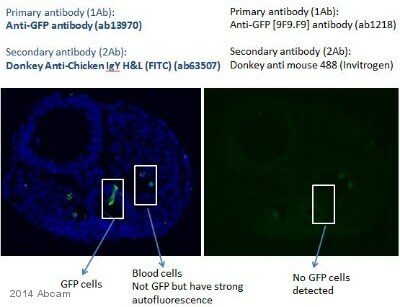 I am looking to purchase a GFP monoclonal antibody that will recognize acGFP. 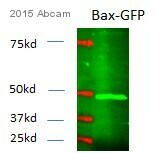 Can you tell me if the product Anti-GFP antibody [9F9.F9] (ab1218) will recognize acGFP? If not. do you have any recommendations. Thank you! We do not have data for reactivity of ab1218 with acGFP but a customer sent a positive review of ab290 for IP and WB of acGFP and acGFP-tagged p27. Here is the URL of the review https://www.abcam.com/GFP-antibody-ChIP-Grade-ab290/reviews/33378 .